Xiaomi massively expanded its retail channels in India this week, and mega sales are on the agenda this week after it sold more than two million smartphones during an event on Wednesday. The Chinese firm staged a 12-hour ‘fan festival’ across seven countries in Asia yesterday, clocking total sales of 2.12 million smartphones and revenue of RMB 2.08 billion, that’s around $335 million. 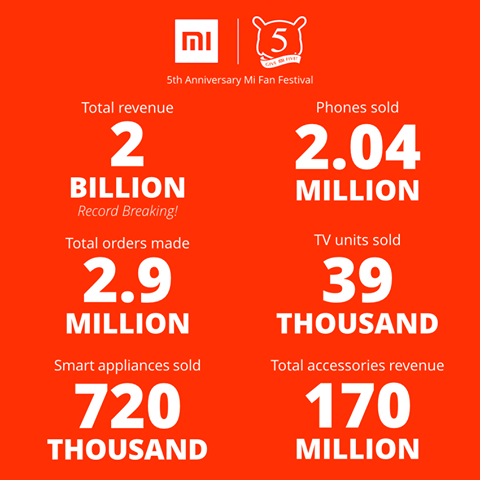 The event, staged to commemorate the company’s fifth birthday, also saw more than 38,000 Mi TVs and over 770,000 smart appliances snapped up by customers. That effort broke its previous best for a ‘flash sale’ event. Sales are an obvious way to boost sales, but Xiaomi’s relationship with its fans is particularly unique. As a Wall Street Journal story this week noted, Xiaomi regularly hosts parties, invites hundreds of (unpaid) fans to launch events — while it maintains an active forum, solicits feedback and pushes out weekly software updates based on interaction with users. All-in-all its relationship with its users is unique, and when you add the online commerce element to that, the recipe is there for big sales days like Wednesday. Xiaomi sold more than 60 million smartphones last year, and the company expects sales this year to reach 100 million. Already it is the third largest smartphone maker for global shipments, and it ranks top in China based on the most recent quarter of business.